What a way to ring in the New Year- this is a beauty that I opened from Magnum. I’m a huge fan of this wine and bought a three year vertical from the Barboursville winery years ago when I visited. I also drank it in regular size offerings on more than one occasion, writing about the 08 Cab Franc back in 2011. Dark purple in the glass and still showing signs of youth. On the nose I get black currants, rich plum compote, a touch of oak and some Ribena. On the palate it is gorgeous. Black fruits galore, iodine, super smooth tannins and lithe acidity. The mid palate has notes of Kirsch, blackberry reduction. The finish is just a great tapering of the whole package- black fruits, gentle tannins, round acidity all ending up with a nice, balanced mouthfeel. 92 points and 4 stars as the wine is no longer readily available in regular format, $180 buys you a Magnum though. Drink till 2024 with all kinds of meat, think Filet, perhaps Moussaka and of course Pasta. I look forward to the next two bottles in the vertical. I am also thinking of buying newer vintages for the cellar, this one obviously did well in its evolution. Salut…. My buddy brought this bottle from home, where it has been resting since he bought it en primeur. I love this chateau, they produce classic Saint Julien and are consistent, fairly priced and good quality. Nearly black in the glass, it shows off beautiful legs. The nose offers up charcoal, plum, black berries, a whiff of alcohol and cassis. On the palate it is somewhat thinner than expected but fresh, bright and still young. I get more dark fruits, gorgeous tannins, ripe acidity, capsicum, leather and Maduro leaf. Black tea shows up in the midpalate with some tar and plum. The finish is medium length, quite dry from the persistent tannins and gives off a white pepper note. Overall this is a delicious, young wine that will stand up to hearty meats, grills, cheese or just by itself. 91 points from me. It currently runs $90, and got an average of 92 points from the pros. For my points, it gets 4 stars, just because I love good Bordeaux! Salut…. This is the second vintage in my vertical tasting. 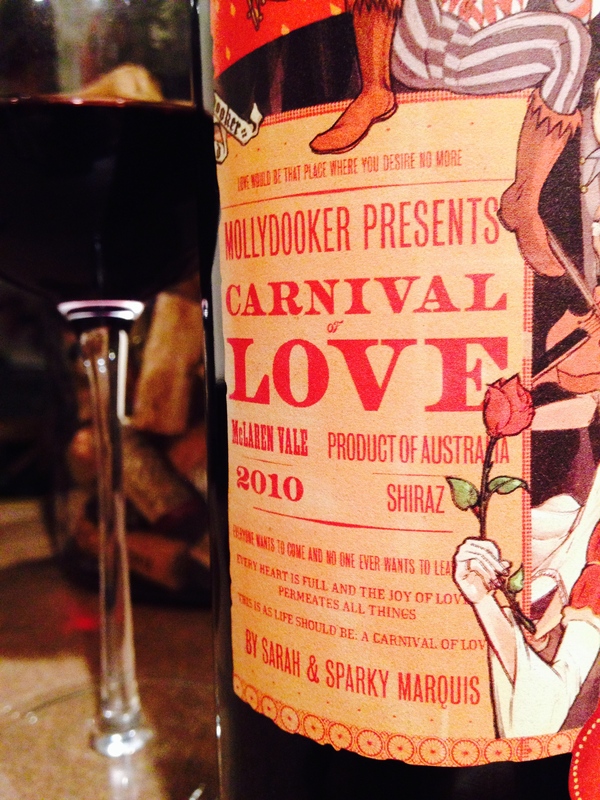 The 2009 Carnival of Love was excellent, and this one continues the streak, albeit in a slightly different way. Inky in the glass I got a big dose of blue currants and black tea on the nose after I ran it through the Vinturi. The initial attack was quite simply deelish. I had to take this picture so you could imagine what I was tasting. Midway through I started getting sour cherries and blackberry. I wrote down on my tasting sheet that I noticed quite a bit of acidity, hence the sour cherry component. On the back end is where the plum compote, spice box and blueberries really came to life. The tannins are slight to the taste, but ever present. The main difference between these two vintages is the level of concentration. The ’09 was very focused, this version is somewhat more open ended with more levels of flavors yet not as complex. The ’09 weighed in at 16%, this one a more palatable 15.5%. Both are drinking beautifully now and will continue to do so for many years, yet my preference is the ’09. This wine scored slightly higher with the pro’s at an average of 94.5. I am going with 92 and three stars for this $90 beauty. I served it with spicy pulled pork, it worked a treat. Salut…. 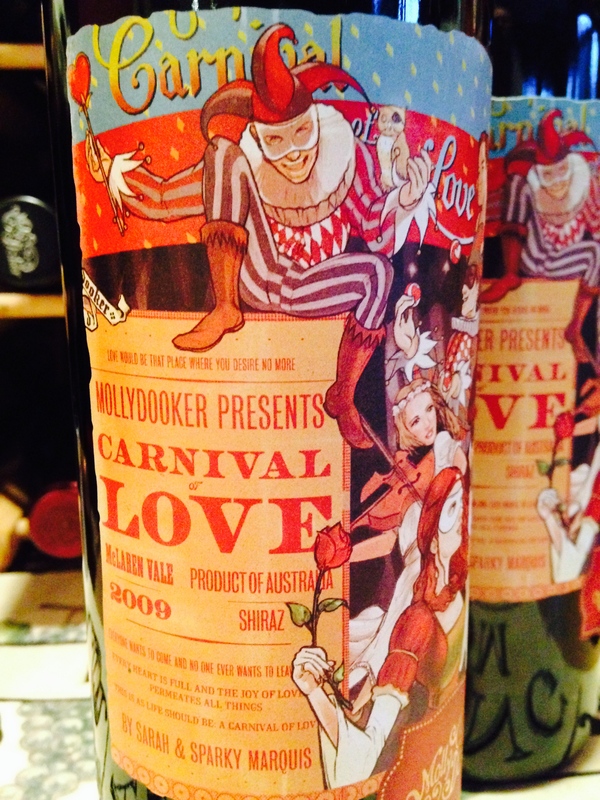 This is the first of a 4 vintage vertical tasting of this fabulous Shiraz. I managed to find the ’09,’10 and ’11 on my travels while the ’12 was sent courtesy of the folks downunda. I started off by sending the first glass throughout the Vinturi and then I performed the Mollydooker Shake on the rest of the bottle to open it up some. 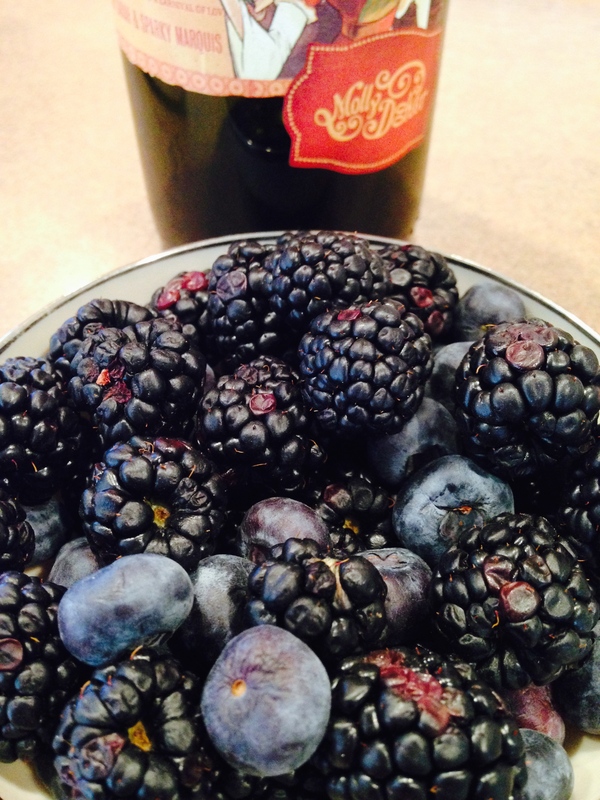 What I saw was a deep inky purple wine that showed off some gorgeous damson plums and Dr. Pepper soda on the nose. The first sip was amazing. Blueberry pie, blackcurrant and nutmeg formed the basis of the flavor profile with some smoke and ink lingering on the mid palate. The level of fruit is amazing and the focus is razor sharp. The wine coats the mouth with the multiple layers of fruit and leaves it rather refreshed by the fine grained, well integrated tannins. The acidity is totally in balance and there is no dryness to the finish. The word ‘concentrated’ keeps popping in my head, I guess I should tell you that this wine is very focused on giving you its all, up front and direct. It is a powerful wine that is not for the faint of palate. Hiding in the swirls of fruit and oak is a well disguised 16% alcohol, not once making its presence known, yet crucial to the backbone of this extracted beast. I thought this one out and decided to pair some NY Strips with it, going for a lower fat cut due to the relative age on the wine. I also prepared some riced cauliflower with sautéed jalapeños and some green beans with toasted almonds. The combination was perfect with the heat of the jalapeños giving the wine a new dimension while the steaks provided the texture I was looking for to offset the raw power of the wine. This wine got an average of 93.5 points from the big boys and I am in agreement. 94 points from me for this $90 treat which makes it a solid 4 star wine in my books. I would love to re-visit in 5 years but alas I only bought one bottle. If you can find it you may want to try it, it’s that good. 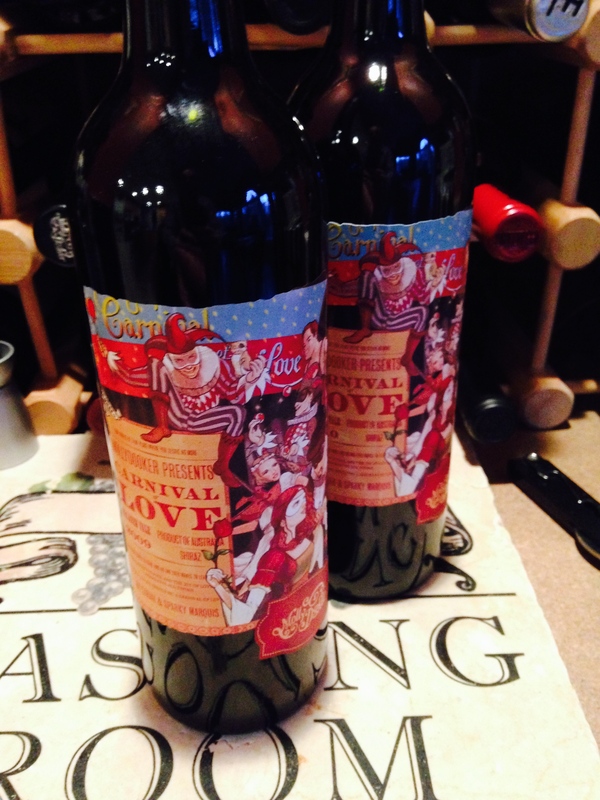 Besides, the artwork is fabulous on these bottles. Salut….